"Thanks for your help and superb service !!!" 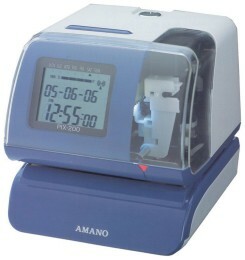 Amano's PIX-200 Time/Date/Numbering Printer has arrived. The most multi-functional time recorder available, having been designed to cater for all business requirements: time recording, job costing, time/date and/or numbering, along with message printing. The TP-50 brings the highest possible flexibility into time & date stamping.